Curious about PDO Threads? How's the Time to Try - Doctor Hermann M.D.,P.A. There are some aspects of your physical appearance that you can influence through exercise, nutrition, sun protection, and strategic skincare, but other components of physical appearance are simply at the mercy of genetics and age. The skin on the face, in particular, often has a mind of its own as you get older. Many women struggle with loose skin that surrenders to gravity and droops down on the face, but they don’t want to undergo a full surgical facelift to regain their youthfulness. If you are frustrated by your own lax skin, there is a new and innovative procedure now available that creates the effects of a facelift without the surgical risk and downtime: PDO Threads. Why Should I Give PDO Threads a Try? 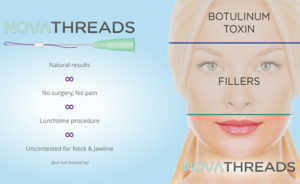 PDO Thread Treatment, also known as NovaThreads Treatment, manages to eliminate sagging skin and contour your neck and jawline without any pain, surgery, or scarring. It’s a quick “lunchtime” procedure that delivers impressively natural results. In the time that it would take to get a manicure or pedicure, you can enjoy a PDO Thread Treatment to eliminate unwanted signs of aging from your face and neck. But Needles Are Involved… Should I Be Worried? It’s true that hypodermic needles are used during this treatment, but it’s definitely nothing to be concerned about. Each needle is actually preloaded with a PDO absorbable suture, which is one of the safest materials that can be implanted into the body, as evidenced by the fact that PDO sutures are used in open heart surgery. Since a numbing cream is applied to your face before the treatment, you won’t even feel the needles as they are strategically inserted into your skin. What Are the Benefits of PDO Threads? The skin reacts with a gentle and selective inflammatory response when the threads are inserted. This inflammatory response is the same technique used to trigger deep healing in other aesthetic procedures like microneedling and laser resurfacing. As a result, the skin begins producing more collagen in an effort to repair the perceived injury, and this collagen is responsible for helping the face overcome signs of aging to look younger and rejuvenated. With just one PDO Threads treatment, you can achieve facelift-like results with lifted and repositioned skin, plump your lips, and minimize signs of wrinkles and facial folds. This FDA approved treatment works magic, so call Hermann Wellness today at (813) 902-9559 to schedule your own appointment in Tampa or St. Petersburg, Florida.